It may still seem like winter here in the North Country, but to one of my favorite winter visitors, spring has already sprung and, sadly, that means they’re quickly disappearing from our yards and bird feeders. For folks who feed birds in our area, the pine grosbeak is pretty much the gold standard come winter and this has been a particularly good season. From the reports I’ve seen and heard, pine grosbeaks have been abundant this year at most feeders, and that has certainly been the case at our house where we’ve had as many as two dozen at a time. It’s hard not to fall for these beautiful and gentle birds, with their soft and pleasing call. For me, and I know for many others, they represent a highlight of winter in the North Country, and are a pleasure largely reserved for those of us who live near the southern edge of the boreal forest. Pine grosbeaks are largely confined to boreal and sub-arctic parts of North America and rarely venture from regions dominated by conifers, whose seeds make up a good portion of their winter diet. Here in far northern Minnesota, we’re within the normal winter range of pine grosbeaks, but they only venture as far south as central and southern Minnesota during the occasional irruption year. The rest of the time, they’re a luxury reserved for those of us who spend winters in the true North Country. The roughly robin-sized pine grosbeaks generally arrive in our area about mid-October, but they initially rely on natural foods, like pine, spruce, and balsam fir seeds, as well as fall fruits, before they start making an appearance at bird feeders. In my experience, they start appearing tentatively at feeders in late November or early December before showing up in larger numbers by about mid-December. 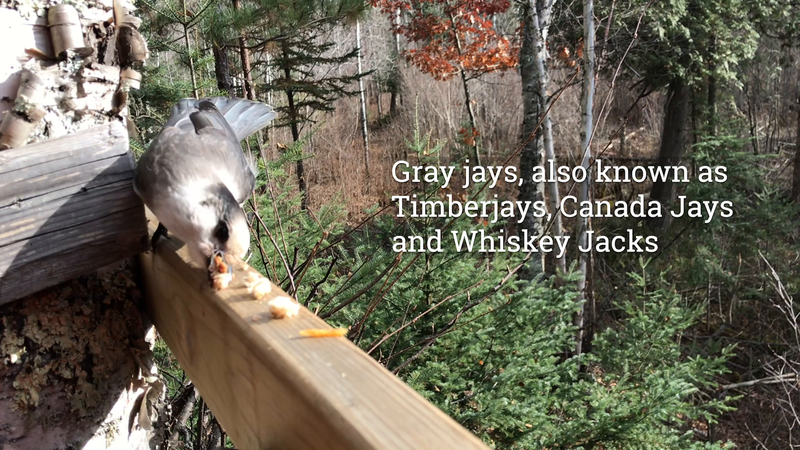 They’re generally a fixture at our feeders from then until the end of the second week of March, when they start heading back north to their breeding territory, which starts about 200 miles northeast of here in northern Ontario. A few isolated, non-migratory populations of these birds are also found at high elevations in Rockies. Among the migratory population found here, the pinkish males usually head north first, followed by the females within a week or so. Like most birds, the pine grosbeak’s natural clock is governed mostly by day length, and by the time we reach the equinox next week it will be spring as far as they’re concerned, which means it’s time to head north. Once there, they’ll pair up for the breeding season, during which they form quite strong monogamous pair bonds. While they are not known to mate for life, the mated pairs have their own identical flight call, which helps them to stay in contact, even with other grosbeaks in the vicinity. If you’d like to attract pine grosbeaks to your house in winter, black oil sunflower seeds are your best bet. They like to feed best on the ground or on large open platform feeders. Unlike their cousins, the evening grosbeaks, which have been in a notable population decline in much of North America in recent decades, the pine grosbeak population remains pretty healthy. And that’s a good thing, because I don’t even want to think about winter in the North Country without my flock of pine grosbeaks to brighten each day. At least by the time they leave in mid-March, we know that winter’s retreat can’t be too far behind.